We are in the last week of our Mega BM, 3 weeks just zoomed past us! ! Yeah, I heard that " usual dialogue ", yes, these 3 weeks were sort of exam weeks for me. I literally prepped the same day for all the papers!!! 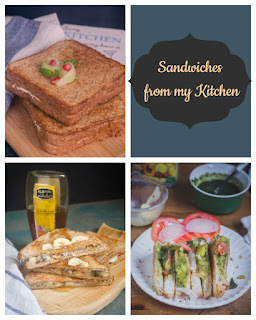 I cooked, styled and clicked every day. Cooking was the easiest part in this, since i planned the dished prior. This so called styling takes hell a lot of time. Though i m not very good at it, i still have to crush my puney little brain to think and use a different board/napkin along with the dishes. But sometimes, you become monotonous, your brain gets clogged and you will not be able to think or imagine beyond the current setup that is before you! Like i have repeated my kiddo's writing desk a hell a lot of time this BM!!! So this brainstorming of setup will be there for another 1 week and then we will be little free to get refreshed and come back again with the same tension in September for the next Mega BM. OK now coming to this week's theme : Tamilnadu Cuisine. 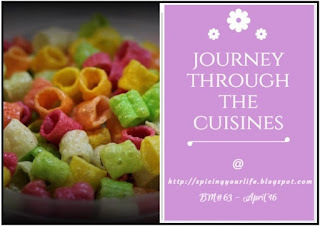 I have tried my level best to blog on some old classics/Traditional recipes. But then this week I have the dreadsome XYZ. God, Save Me!! For today i bring you an authentic temple prasadam, Karuppu ulundu dosa, Azhagar Kovil Dosa Prasadam. 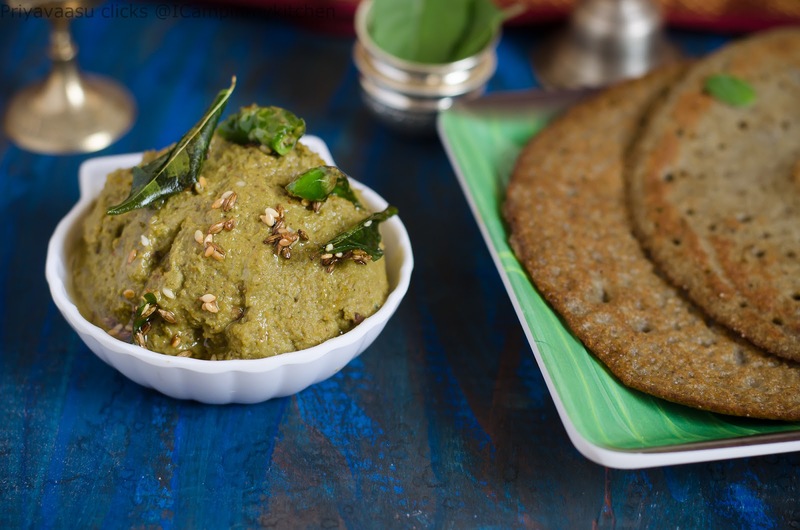 I know it is made of black urad dal, but while searching for an aunthentic recipe i came across many blogs using the normal Idly/dosa measurement with parboiled rice. I was sure that Kovil Prasadam's are made only using Raw rice. Thankfully, i remembered Shanthiji's blog and she recently blogged about this Dosa recipe too. 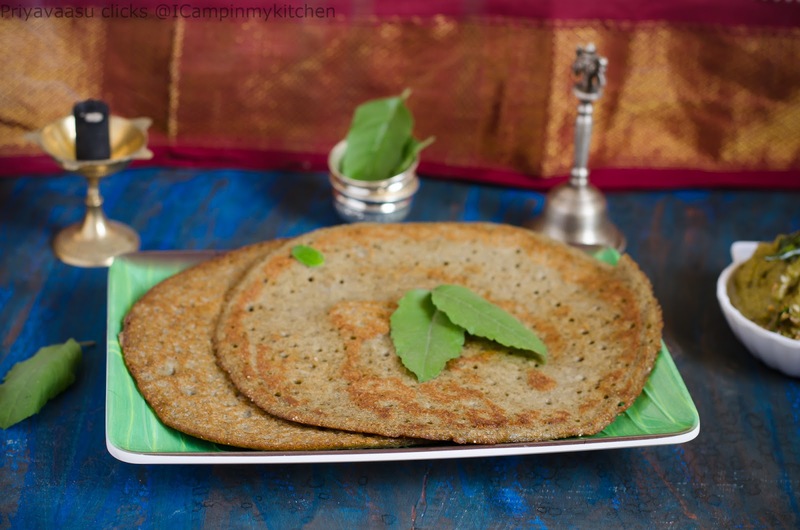 The recipe was from the temple Madapalli/Temple Kitchen and from a person who serves the Lord Kalazhagar on a daily basis. The temple is at the foot hills of Azhagar Malai and also one of the 108 divyadesams of Lord Vishnu. 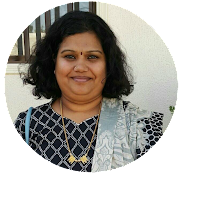 Shanthiji has shared some interesting titbits on how this delicious dosa is made. I m sharing her from her blog . The Dosa is cooked in a panchaloga tawa, a giant-size dosa pan made of 5 alloys. It is deep fried in ghee. No oil is used. 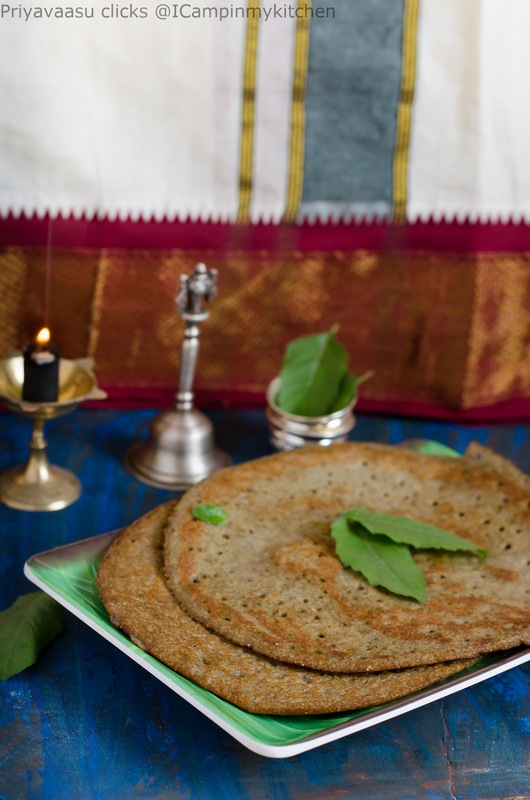 The batter for the Azhagar dosa is made in the morning and it is offered to God in the evening. Only one Dosa is made in a day. The dosa is torn into pieces and given along Black chana sundal to Ghosti (a setof people singing hymns). However, during auspicious days and festivals, there might be more people in the Ghosti(set of people singing hymns), so the dosa is made accordingly. 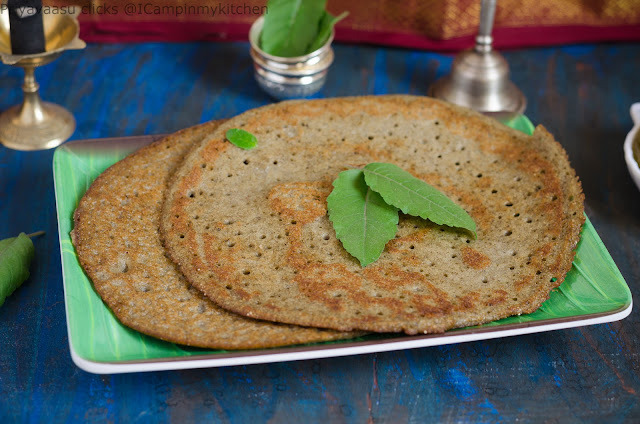 This batter is spiced using pepper,cumin and ginger which gives an unique taste to the dosa. The dosa can be made thick or thin according to your wish. I made paper thin dosa for our dinner and we loved it. The taste resembled Anjaneyar Kovil Vada. I served the dosa with Urad dal and sesame seeds chutney. Wash rice and dal and soak them together for 4 hours. Drain and grind them together along with pepper,cumin, ginger and curry leaves. Do not grind the batter too fine. Let it be little coarse. Originally as per shanthiji recipe, the rice is soaked and sundried, then broken into fine powder. The urad dal batter is ground well and this rice powder is added to the batter and whisked well. But i was too lazy to soak and dry rice, followed the quick route of grinding it along with urad dal. Let the batter sit for 2 hours on the counter. Before making the dosa, add salt and mix well. Heat a dosa pan, pour a ladle of batter in the center and spread it into a circle. Pour a tsp of gingely oil around the corners. Be generous with gingely oil. Once the edges turn crisp and brown, flip and cook the other side for a minute. Remove the dosa from the tava and serve it along with your favorite chutney. I served it with Urad dal and sesame seeds chutney. I agree with you on styling. For each dish it was nerve racking coming up with a unique styling. I like the your setting for today's post. 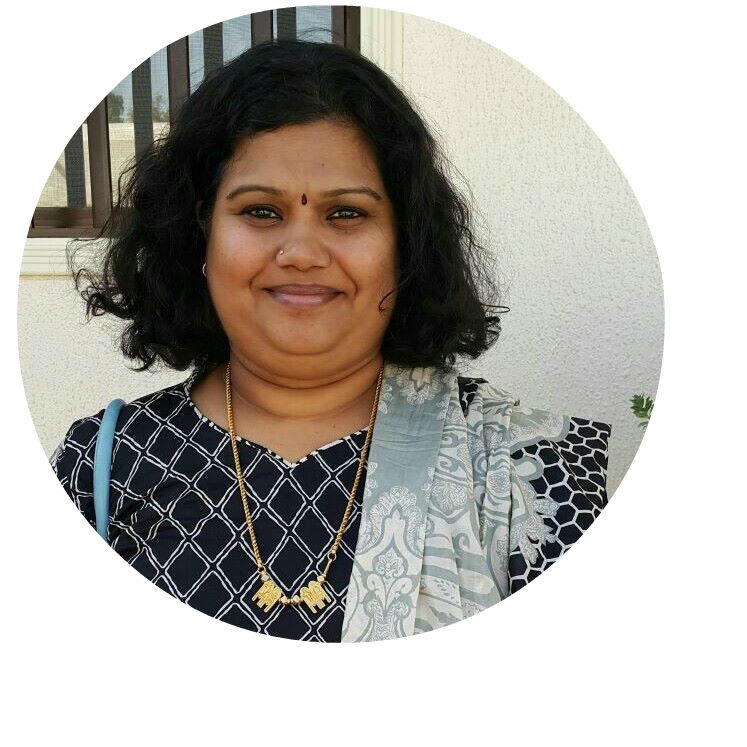 Kudos Priya, cooking everyday and posting is commendable, I would die of nervousness:))..all your dosas are a hit and I know where to come when I want to make a new dosa..simply amazing. Very tasty and flavorful dosas. I made this for one of the BMs earlier edition and loved it so much that it has become a regular in my home now. Priya I guess you are being very hard on yourself..I enjoyed all your setup and though I do agree cooking, editing and posting on the same day is tiresome, you managed it so well..kudos on that..lovely theme and lovely dosas..you know my love for dosa right..and enjoyed reading the tidbits too.. Very nice. Well presented. Thanks for linking my blog. Looks so amazing Priya. The dosas have turned out so delicious..
Wow, thats a fabulous pick for U Priya, dosas came out simply awesome and that chutney steals the show. What a lovely looking dosa Priya. It looks soooo inviting. Love this dosa. Beautiful set up. 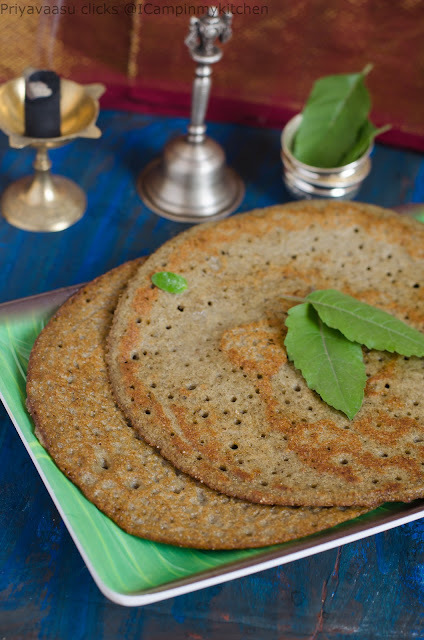 Urad dal dosa looks soft and spongy. Lovely dosa and great setup. Loving the recipes you are bringing up here!